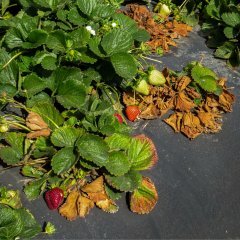 Strawberry is plagued by several pathogens that cause root and crown rot (abbreviated RCR), which can lead to reductions in plant vigor as well as yield loss and even plant death. The responsible or­ganisms vary regionally in the United States and depend on climate, soils, and presence of pathogen inoculum. In California, Verticillium dahliae, Fusarium oxysporum f. sp. fragariae and Macrophomina phaseolina are the primary organisms contributing to RCR. In contrast, the primary causal organisms of RCR in Florida include Phytophthora cactorum, Colletotrichum spp., and Macrophomina phaseolina. Regardless of the specific microorganism, the symptoms are similar and the impact of root and crown rot can be equally dev­astating. California and Florida are the leading national producers of strawberry and struggle with management of RCR, mainly due to the recent loss of methyl bromide and additional restrictions on the use of other soil fumigants. Improved disease resistance through targeted breeding approaches will be a significant contribution to in­tegrated disease management strategies less reliant on fumigants. strawberry due to root and crown rot. The symptoms of RCR on strawberry are similar for all of these pathogens. Growers may first notice discoloration of foliage, stunt­ing, production of small leaves, and reduced vigor. Symptoms be­come more apparent as the growing season progresses, especially when plants start producing fruit. At this stage, plants may wilt rapidly, collapse and then die (Fig. 1). Examination of the crown and roots often reveals discoloration, internal browning (Fig. 2), and poor root growth. Fruit rot may also occur in some cases. Although knowledge of the field history and cultivar susceptibility can be helpful, accurate diagnosis of the causal organism(s) is best done through laboratory isolation, culture, and microscopic examination. Identification of the pathogen(s) is required for mitigating further disease damage, as different RCR pathogens respond differently to chemical and cultural control. Figure 2. Internal browning due to root and crown rot. While all root and crown rots are potentially devastating, RosBREED 2 will be focusing particularly on Phytophthora root and crown rot. This disease is particularly problematic in Florida, where rainfall, saturated soils, and warm temperatures favor the development of Phytophthora. Symptoms of this disease are usually most readily observed in low, poorly drained areas of a field and extend to other areas as the season progresses. The disease cycle begins when over­wintering spores (oospores) of the pathogen, Phytophthora cacto­rum, germinate to form structures that subsequently produce motile spores (zoospores) capable of swimming through wet areas towards host tissue. Once infection of host tissue occurs, the patho­gen can reproduce and infect neighboring plants. Several features of P. cactorum make it particularly challeng­ing to control, including pro­duction of mobile zoospores capable of spreading in water in the soil and the ability to produce overwintering oo­spores that are long-lived and persist in the soil for many years, rendering short crop rotation relatively ineffective. Furthermore, suitable land for growing strawberry is limited and crop rotation is not eco­nomically viable for strawberry growers. Current management techniques are not very effective at limiting losses caused by P. cactorum. Soil fumigation and fungicide appli­cations are also facing increasing scrutiny and regulatory pressure. New cultivars that combine disease resistance with high fruit qual­ity would be a powerful tool in integrated disease management programs. Breeders and pathologists are making progress in this endeavor and RosBREED 2 will help foster continued work as we collectively combat these important Rosaceae nemeses.